There are two great options to help Frager's Hardware rebuild in the aftermath of the devastating June 5 fire. The first is to donate, and you can do so here, at the Capitol Hill Community Foundation. CHCF also helped Eastern Market rebuild after the fire there in 2007. The second thing you can do is SHOP! Yes, that's right. Frager's Hardware will be holding a "Pop-Up Shop" in Eastern Market this Sunday, June 9, with items salvaged from the garden center. Come by and show your support, as Frager's prepares to rebuild. Even Presidents shop at Frager's. 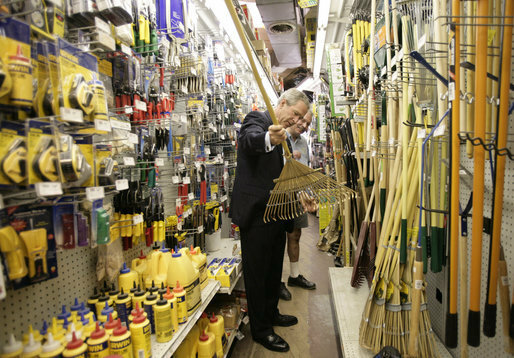 Here, President Bush selects a rake from the Minoan maze of merchandise on May 5, 2006. Photo by Eric Draper. 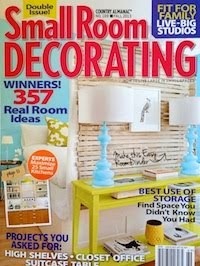 Congrats on the great spread in Small Room Magazine. It was fun to see your actual floor plan. Good job!